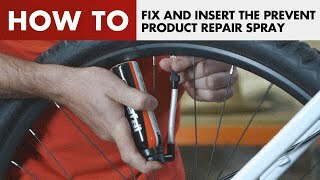 An absolutely essential product for commuters, or those who rely on their bikes, The Zefal Sealant Spray can self inflate a punctured inner tube and seals the hole at the same time. No need to remove the tyre when you puncture, just attach the hose to the inner tube valve and press the button - you'll be up and tolling in no time. Seals up to a 2mm perforation in the inner tube - that's the size of hole a large thorn, drawing pin or tack would make.